Defined as activation of the pancreatic enzyme resulting in autolysis of the gland. It is important to investigate for the possible causes of Acute pancreatitis before labeling it as 'idiopathic'. Both males and females are equally affected. Age of onset is around 4th - 5th decade of life. Though rare, but ask for recent contact with children with mumps or cocksakie infection. Symptoms are usually triggered after consumption of large meal or alcohol. Patient usually complains of sudden onset of severe, continuous epigastric pain, which typically radiates to the back, relieved by bending forwards. It's accompanied by excessive vomiting and retching, with persistent nausea in between. Breathing and movements exacerbates the pain. Patient appears ill, with shallow breathing. 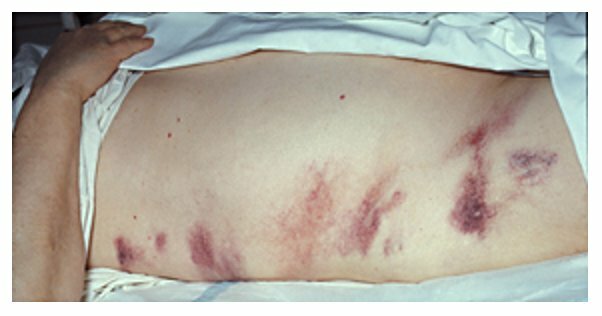 If the patient looks pale, diaphoretic, it is likely that it has complicated as a hypovolemic shock. There might be mildly tinged jaundice if the pancreatitis is caused by gall stones. Even 2-3 days after the illness, the mild tinged jaundice can be caused by compression of biliary duct by edematous head of pancreas. Shock features of tachycardia, hypotension. Low grade fever may or may not present. On inspection, if there's haemorrhagic pancreatits, there might be bruising (bluish purplish) discolouration over around the umbilicus (Cullen's sign) or left flank (Grey Turner's sign). However, these signs are rarely seen nowadays. The abdomen may not rise and fall with respiration, since the musculature is tightly contracted, and during onset of paralytic ileus. Often there is accumulation of inflammatory exudates within the lesser sac, which eventually forms pseudocyst, suggested by epigastric fullness (distension), dullness during percussion over it. Shifting dullness may be present, bowel sound may be reduced if there is pancreatic ascites. Acute pancreatitis is usually diagnosed by typical clinical presentation and laboratory investigation that reveals elevated serum amylase level. Serum amylase of 3-4 times greater than the normal level is suggestive of pancreatitis. However, if serum lipase assay is available, it is more sensitive and specific. 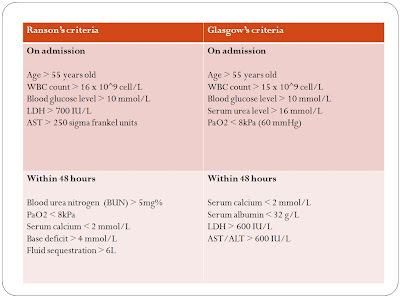 Note that normal serum amylase level doesn't rule out Acute pancreatitis, and the level poorly correlates with the severity. 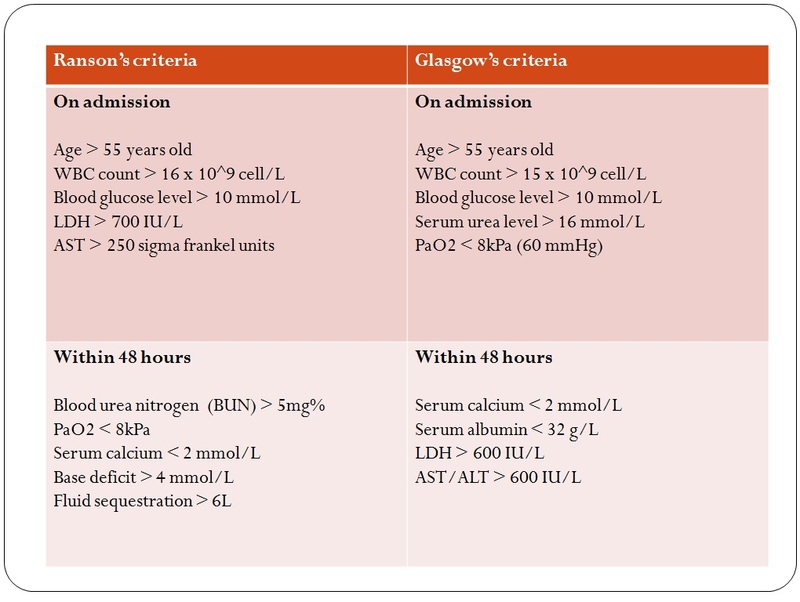 Both Ranson's and Glasgow's criteria is used to grade the severity of Acute pancreatitis. If 3 or more factors are present in the patient, it indicates severe pancreatitis. 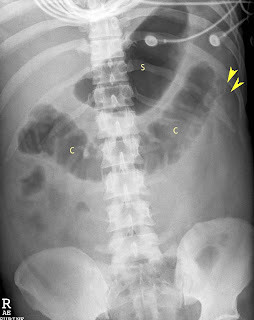 During early stages, if abdominal X ray is taken, non-specific signs such as Sentinel loop, Renal Halo sign or Colon cut off sign may be present. Chest X ray may reveal pleural effusion, or if there is diffuse alveolar infiltrates, indicates ARDS. Though Abdominal USG is non-diagnostic for Acute pancreatitis, but it must be done within 24 hours of presentation. CT abdomen is not indicated in every patient. 1) Gain IV access and rapid fluid resuscitation. If gall stone is strongly suspected as the cause of pancreatitis, the stones should be removed by basket (dormia) through endoscopic sphincterotomy. 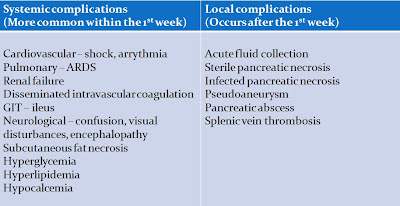 If there is severe pancreatitis, or cholangitis occurs, both sphinterotomy and ERCP is done. 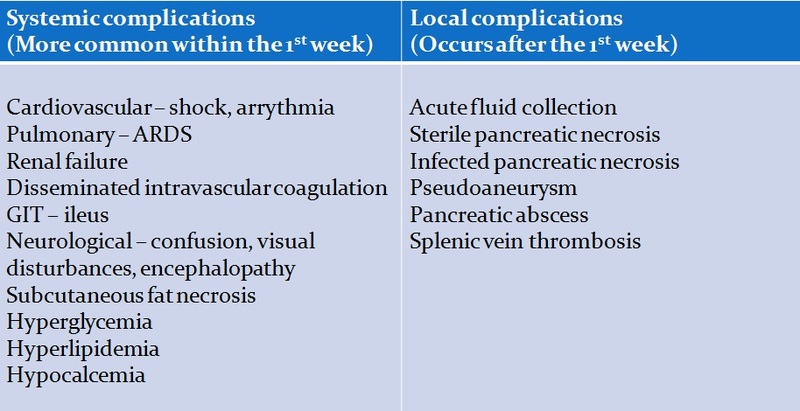 Only indicated if : clinical deterioration during conservative management, unsure diagnosis, local complication occurs. 85% of CA pancreas involves the head of pancreas, where the prognosis is usually poor. Upon presentation, most have progressed to a surgically incurable stage. Though uncommon, but tumour arising from the distal CBD, duodenum and ampulla has a better outlook. Any elderly patient presents with painless jaundice, always suspect the possibility of Pancreatic cancer. Typical symptoms are usually : Abdominal pain, jaundice and weight loss. Jaundice is usually obstructive in nature, suggested by the classical triad of pruritus, clay-coloured stool and tea-coloured urine. "For patients presenting with clinically evident jaundice, and on examination the gall bladder is palpable, the cause is more likely to be due to Carcinoma of the Head of Pancreas". Look for scleral icterus, hepatomegaly, etc. If stool occult blood test is positive, suggestive of a ampullary tumour. To confirm the nature of obstruction, MRCP is preferred over ERCP since the former is less invasive.